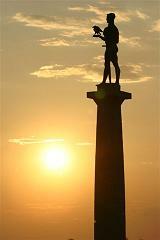 The capital of Serbia is city of Belgrade (Beograd). It is one of the oldest cities in Europe and since ancient times it has been an important traffic focal point, an intersection of the roads of Eastern and Western Europe. 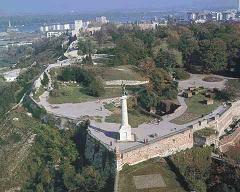 Belgrade is situated in South-Eastern Europe, on the Balkan Peninsula. It lies at the point where the river Sava merges into the Danube, on the slope between two alluvial planes. The river waters surround it from three sides, and that is why since ancient times it has been the guardian of river passages. Because of its position it was properly called "the gate" of the Balkans, and "the door" to Central Europe. Along the ridge of the slope, from Kalemegdan, along the Knez Mihailova street, across Terazije to Slavija, stretches the main city traffic artery. Belgrade, a city of very tumultuous history, is one of the oldest cities in Europe. Its history lasts full 7,000 years. The area around two great rivers, the Sava and the Danube has been inhabited as early as palaeolithic period. Remains of human bones and skulls of Neanderthals, found in the stone-pit near Leštane, in a cave in Čukarica and near the Bajloni market, date back to the early Stone Age. 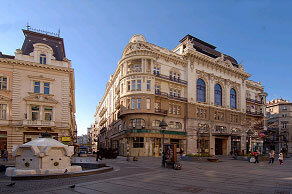 Belgrade is the centre of culture and art of Serbia. It is Belgrade where our most notable artists create, where over 9.000 theatrical performances, exhibitions, concerts, performance events, and other artistic programs are presented and where prominent authors in the world of art are hosted. Belgrade is the centre of the highest state and national institutions of culture and art: Serbian Academy of Arts and Sciences, the National Library of Serbia, the National Museum, the National Theatre and the University of Arts.